In my last post, I was quite nostalgic/euphoric about the fact that I got to revisit my old hunting grounds in Ljubljana. Yesterday, I was once more reminded that (business) travel sometimes can be a bit lacking in glamour...I got to spend A LOT of time at Ljubljana's central railway station, or Železniška postaja, if you'd like a little tongue-twister. Now travelling by train (there is no bus service that I know of) from Ljubljana to Klagenfurt is not exactly comfortable and convenient even without delays. If you go by car, it's a little over an hour. 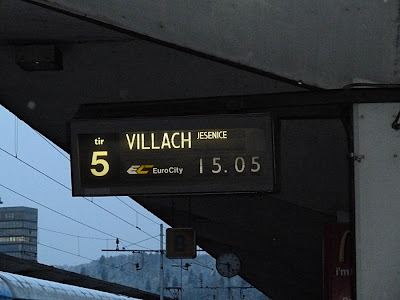 By train via Villach, it's about 2.5 hours, depending on your connecting train from Villach. So when I arrived at a quarter to 3 yesterday and went to buy my ticket for my train at 15:05, the lady at the international ticket counter informed me that the train would be at least two hours late. What? It was coming from Croatia and there were massive delays (perhaps due to snow, who knows). 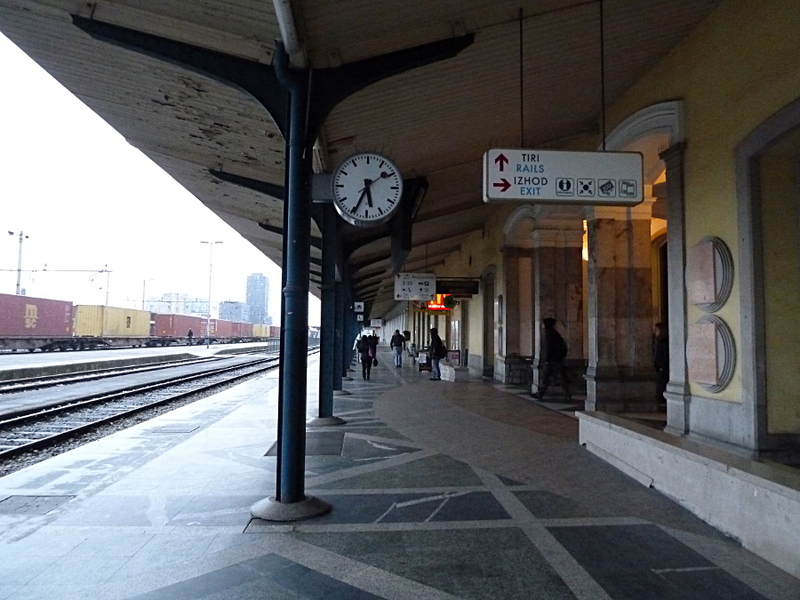 Mysteriously, the old-fashioned announcement board still showed the regular time and track, with no mention of delays. I then went into the information office to inquire and was told to return at 5:30 to ask again as it would probably be 3 hours delayed. Great. With no other train to Austria before that I had to kill a lot of time. I've had delays and cancelled flights at airports before, but - believe me - this is half as painful as airports tend to have way nicer infrastructure. Whereas the old town of Ljubljana is a true gem and there are several other nice parts of town, the railway station and its vicinity definitely isn't one of them. It's the type of charmless place you'd that could serve as a backdrop for a film set in a remote Siberian village back in the days of the Soviet Union. I'm only slightly exaggerating. The whole place is chilly and drafty, which I'm sure is lovely and welcome on a hot summer day, but not so when it's cold and snowing. There is only so much time you can spend at Mc Donald's (WiFi!) or random cafés in the buiding, so I ended up consuming a cappucino, an orange juice and a fruit tea. Thankfully one of the to things I can say in favour of LJU train station (the other being friendly staff at the info counter, who definitely speak better English than your regular OEBB staff) is free public toilets with(!) toilet paper. After gulping all those liquids I came to know it quite intimately, you know. I splurged on a fat and overpriced issue of American Harpers Bazar and hoped for the best before I'd stab myself with a plastic fork somewhere. The train finally turned up "210 minutes delayed" as the lady on the intercom put it and a bunch of frozen-stiff foreigners jumped on it. I managed to transfer from track 1 to 7 in Villach in 2 minutes flat and jump on the already departing train and was at my parents' at a quarter past 9. My pity-party was interrupted after talking to a German man on the same train who missed his connecting train to Salzurg and had to kill time until 2 a.m. in Villach before he could continue his complicated onward journey to Hannover.